My Outfitting business (license # 8313) is located in Northwest Montana, right in the middle of God’s Country. I am a native of Montana, born and raised in a family outfitting business. My guides and I work hard to ensure you a top quality hunting experience. We sincerely care about your hunt and prepare year round by scouting, hanging trail cameras, and shed hunting so that you will be hunting the best areas for trophy big game. Our goal is to make sure that you will be more than pleased with your Montana hunting trip of a lifetime. We offer fair chase hunting in prime big game hunting areas. We hunt for Elk, Whitetail, Mule Deer, and Black Bear in both the archery and rifle season. We also guide for special draw tag hunts, such as Mountain Lion, Big Horn Sheep, Mountain Goat, and Shiras Moose. We guide hunts in the Lolo, Superior, and Kootani National Forest mountain ranges and have one of the largest outfitting areas of any outfitter in the state. This vast area allows us to scout more and ensure that we have more than enough area to hunt. Most of the hunts are done on foot, although sometimes we use horses and or spike camps to gain further access into the mountains. We strive to constantly hunt new terrain, never hunting the same area twice. The method of hunting used depends on the best chance of getting your trophy. Home base is at the lodge, where a hot shower, great food, lively conversation, and a good night’s rest will get us prepared for the next day’s hunt. We also offer summer and winter recreation activities at our lodge. Tucked away in Western Montana, we have many lakes and streams for fishing, and great opportunities for photography. Our clients are able to view wildlife and scenic areas on horseback or by hiking in to witness Montana’s beauty at its best. Hopefully you decide to join our outfit and experience Cody Carr’s Hunting Adventures. Thank you for your interest. If you have any questions, please feel free to contact me. Licensed outfitter since 2004. Cody was one of the youngest outfitters to get his license in the state and has grown up in a family outfitting business all of his life. Cody has guided every year since he was 18. 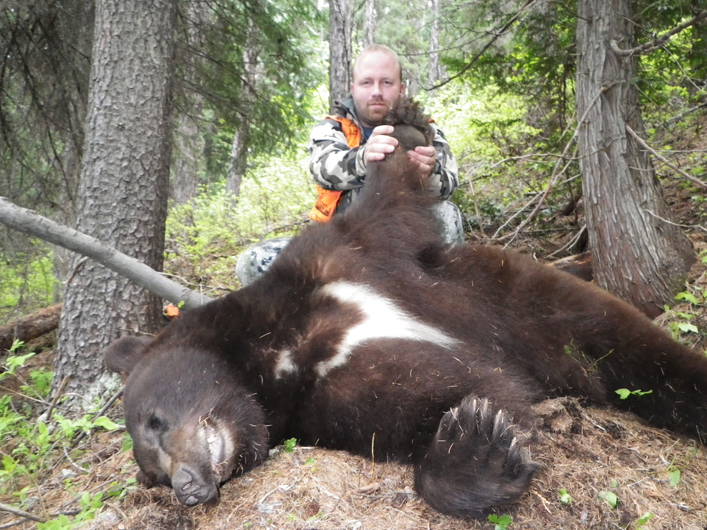 A Director of Montana Outfitter and Guides Association last three years to present. Cody Carr’s Hunting Adventures has been honored to host Catch A Dream Recipients, Wounded Warrior recipients. Read “Catch A Dream” Story – by Sam McCreary.